1. Start with a piece of dowel 3/8"-3/4" in diameter. Judge the best diameter by holding various dowels and sensing which size "feels" best in your right hand (even if you are left-handed)'. Cut your chosen dowel to 36V*" in length. With sandpaper, round the ends so that the final length is exactly 36 inches. Now lightly sand the rest of your future wand to take off any surface dirt or uneven surfaces. Give the entire wand a white undercoat. Following the directions on your paints, wait the appropriate length of time, then give it a second white undercoat. 2. Measure seven inches from one of the ends. At this point make a dark but narrow black line around the wand. Two inches further from this line (9" from the end), make another black line. Continue making thin black lines until you have drawn a total of 13 lines. The image of your wand at this point is that you have at one end a space of seven inches, at the other end a space of slightly under five inches, and between these two areas twelve spaces of two inches each. A simple way to get straight lines around your wand is by taking a small card, wrapping it around the circumference of the wand at the appropriate area, and using the edge of the card for a guide. 4. It would also be a good idea to sleep with the Rainbow Wand in your bed next to you. Make sure that the white end of the wand is toward your head. 5. 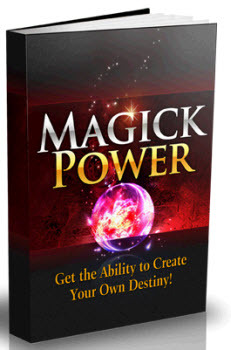 It is in these ways that the wand slowly absorbs the energy you have been controlling and becomes a magickal part of you. Similarly, you become a magickal part of it. 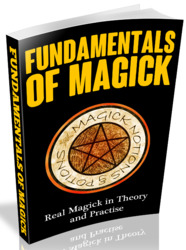 Magickally, it more than represents you, it is your magickal counterpart. The symbolism of the Rainbow Wand is both obvious and deep. First, we can see that white, the color used to represent the element of Spirit, also undercoats the entire wand. It is the basis for everything, even the darkness at the other end of the wand. If there was no light, how could you tell when it was dark? Second, notice that the color spectrum, the rainbow, only occupies the center part of the wand. In a similar manner, the Wand, as a representation of our magickal power, takes us beyond the physical realms represented by the visible spectrum. Third, the number of black lines is 13, the number of unity according to Gematria. As such, it also represents a link to the unitary Divinity, to God. 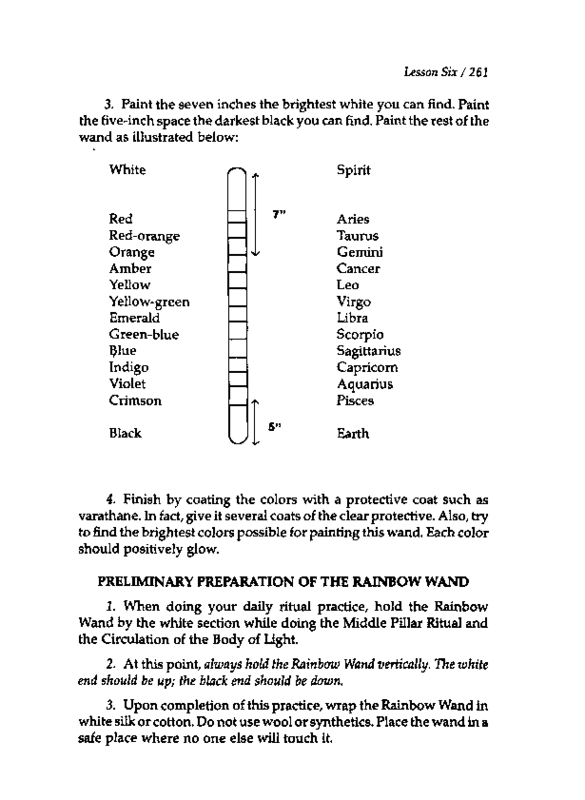 Once you have spent at least one month working with your Rainbow Wand as described above, you will be ready to consecrate it to magickal purposes. Be sure you work with it for at least one month before doing the following consecration.